Daddy-O! Are you ready for the next sock hop? We can’t wait to cut the rug with some of the coolest cats on the street! The 50s were a fantastic time to be a teenager (so we’ve been told) with all the new music coming out, hot rods ruling the roads, and phrases like “what’s the tale, nightingale,” “Burning rubber,” and so many more! Just thinking about it makes us want to blow the dust off our old records and put on our dancing shoes! 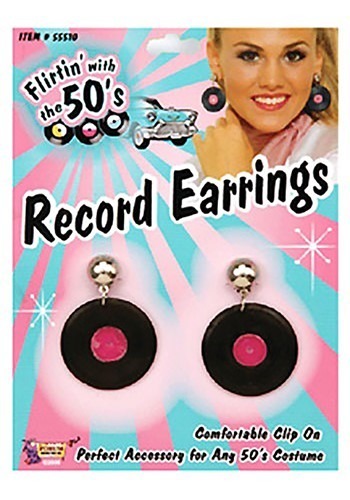 Before you head off to the next dance, don’t forget to throw on these terrific clip-on earrings. They look just like your favorite tunes and will go with any of your scarves. All you’ll need is to decide which personality you’re going to choose. Will you be the cute cheerleader with a bow in your hair and a lovely pencil skirt, or a rough and tough greaser chick with leather pants and a dark pair of shades? Either way, it’s going to be one wild ride!